Dr. Knox chose the field of Podiatry because he wanted to make a difference. He enjoys the challenge of keeping his patients happy, walking, running and being as active as they can be. 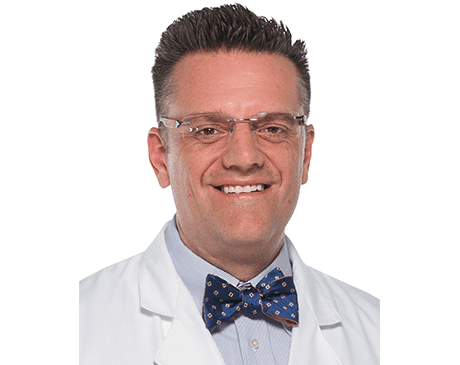 He enjoys all aspects of Podiatry, whether it is fixing ingrown toenails in the office or correcting deformities and fixing fractures in the operating room. His patients know that he cares about them and their health concerns. Dr. Knox and his wife of over 20 years, enjoy home life with their 3 sons and daughter. Work and training have taken their family around the country (Utah, Wyoming, Ohio, Pennsylvania, Louisiana and Tennessee) and they have loved all the many states they have lived in. Dr. Knox is originally from Oregon, then finished high school in Utah before serving for 2 years as a missionary for the Church of Jesus Christ of Latter-Day Saints. He then finished his undergraduate work at Weber State University and the University of Utah. Ohio College of Podiatric Medicine,Cleveland, Ohio, 1997-2001.